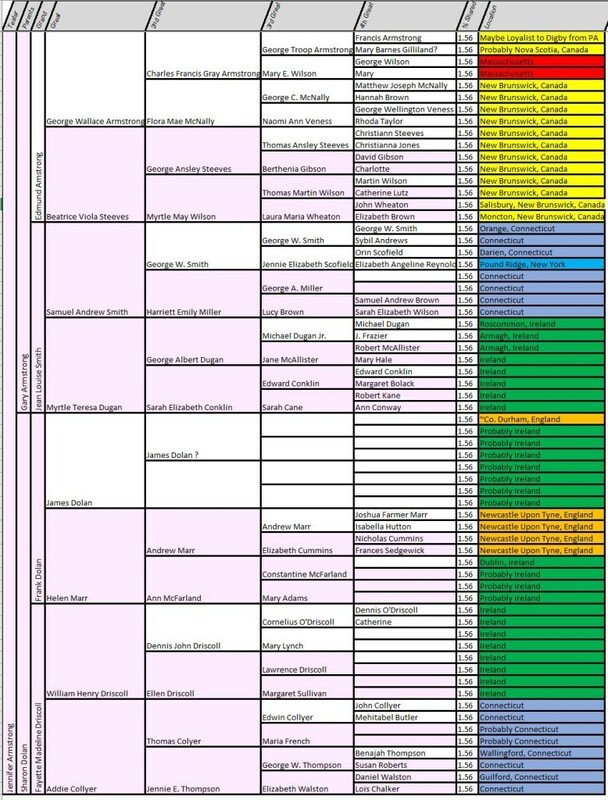 A while back there was a discussion about building compact pedigree charts in Microsoft Excel. These allow us to quickly have an overview for comparison, especially with DNA matches. I took mine a step further and added locations, as well as the statistically expected amount of shared DNA from each branch. The pink boxes in the chart indicate the X-chromosome inheritance pattern, which allows me to quickly determine if an X match could be from that particular ancestor. After the colorized birthplace pedigree craze this week, I decided to integrate the fun visual element of color into my location column. If you want to try one in Excel for yourself, you can find a blank template here. There are several methods to save the image and I use a simple one. In the Excel toolbar, I click “view” and then uncheck gridlines and then snag the image with the Microsoft Snipping Tool that is built in on a PC. As a reminder, when you publish information, please consider privacy. The only living person except me in these charts is my mom. My mom is absolutely ok with being part of my genealogical demonstrations and I have her explicit permission. Your family members may not want to be included. Please do not share information about living people without their permission. My compliments on your informative blog. Your Excel idea interests me. I am wondering if the location entries apply to all the descendants of your 3rd g-grandparents, or just them only?